William Thomas Bahr (Aénȯ héso “Little Hawk”), 28, of Lame Deer passed away on April 1, 2019 at Billings Clinic after a short illness. He is no longer suffering, Limberhand. Bill was born in Billings, MT to Joseph D. Bahr Jr. and Tana Brady Teeth on September 20, 1990. He was raised by his grandmother, Bonnie Jean Belt. Curtis and Sally Yarlott helped to raise Bill and he became like a brother to their sons, Victor and Lance. He attended St. Labre Indian School from Kindergarten until his high school graduation in 2009. 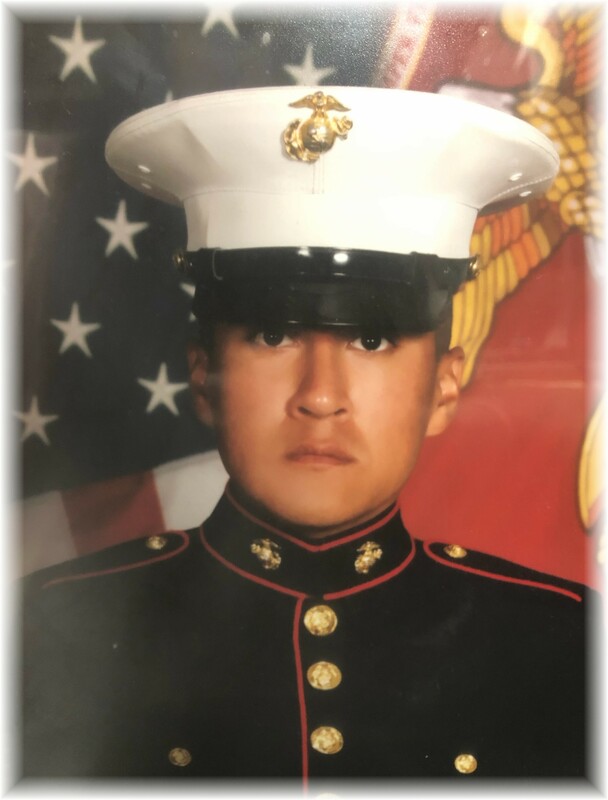 He briefly attended MSU-Bozeman before returning home to Lame Deer where he worked in several different capacities before he enlisted in the United States Marine Corps in 2013 where he served as an analyst for the Signals Intelligence (SIGINT) with the 1st Radio Battalion until February 2019 when he was honorably discharged. Hobbies included hanging out with the boys, spending many hours playing video games, hiking in the hills, running, and reading. He loved sitting outside by the fire looking at the stars and listening to music on his record player. He was preceded in death by his mother, Tana Brady Teeth; brother Benjamin Kyle Bahr, maternal great-grandmother, Fern Shoulderblade; and paternal grandfather, Joseph D. Bahr Sr.
His brothers, the cockpit; Ty Wilson, Tate Wilson, Kyle Limberhand, Teague Evans, Ben Bahr, Dakota Bahr, and Lane Red Wing. Bill’s significant other and partner in life was Misty Russette, who was by his side until the end. Bill is survived by his father, Joseph D. Bahr Jr.; siblings:, Dakota (Delores) Bahr of Hardin, MT, Joseph (Baby Joey) Bahr III, Jessica (Jessie) Bahr of Lame Deer, MT, and Cheyenne Gonzalez of Missoula, MT; grandmothers: Bonnie Spang Belt, Annette Standing Water, Ester Brady, Irene Flying, Serena Brady, Shirley Brady, Cecelia Thex, Carol Bahr, Hansa Faye Burns, and Maryann Bighead; grandfathers: Arthur Teeth, Leroy Spang, Wilmer Spang Sr., Terry Spang Sr., Jule Spang Sr., Benjamin Bahr, and Francis Bahr; paternal aunts: Latisha (Brian) Belt-Wester, Lakota (Shan Hill) Belt, Jolisa Bahr, and Mary Lou Bahr; paternal uncle, Sydney Bahr; maternal aunt, Fern Standing Water; maternal uncles, Denny Standing Water, Calvin Brady; nephew, Cassius Dalton Chey Bahr; nieces, Zelda Lily Bahr, Briseis Blue Bahr cousins: Chenee, D’Andre, Jules, Shahila, Delano Jr., Rileigh, Brendan, and Zaiden; and extended families: Spang, Bahr, Teeth, Standing Water, Brady, Shoulderblade, Seminole, Woodenlegs, and Thex. Bill comes from such a large family please forgive us if we have left anyone out. The family of Bill wishes to extend our sincere thanks to the nurses at IHS, the staff, Dr. Darilek, Dr. Hixson, the nurses, and CNA’s at Billings Clinic. My heart and prayers go out to Bill’s family and friends. I have many fond memories of him and his brothers as students from the time they were in elementary grades at St. Labre. Thank you for your service in the Marines. Sending my condolences to the family. So sad. Thank you for your Service in the Marines. My heartfelt sympathy goes out to Misty and Bill’s family. TO THE FAMILY OF WILLIAM BAHR, THE NORTHERN CHEYENNE CHIEF COUNCIL EXTEND THEIR CONDOLENCES AND PRAYERS FOR STRENGTH DURING THIS MOST SAD, SORROWFUL AND MOURNFUL TIME FOR THE LOSS OF A BELOVED LOVE. It was an honor serving with you Bahr. Farewell, till we meet again. My condolences to the family. Please let me know if I can help with anything. I love you Bahr. The times we’ve shared and the conversations we have had, I will never forget. I remember climbing on top of the barracks with you and I was so excited to show you and make you feel happy after your dog had passed away, and you were. That specific memory I will never forget. You were funny and witty. You really knew how to listen and relate and honestly just really glad I met you in my life. I’ll see you one day brotha man. I’m still your v-hut (or however you spell it) haha. I know you’ll be right next to me still to this day if I get sad, or need advice. I’m sorry I can’t go to your service due to my current situation in the marines. To the family; just know that William was an amazing person out here in California. He always tried to help people out and loved to just live life to the fullest. He was funny and just a good genuine person. He was his own person. Even as strict as the marines tried to make it on everyone to be the same, he would always stand out and anyone that knew him knew that as well. I love you buddy. Sending my condolences to Joey, Misty, & the rest of the family & friends of Bill.. You’re in my prayers. My deepest condolences to Dakota, Bonnie and family. Bill was always a humble and peaceful person. May he rest in Ma’heo’o Creator’s glory. Continued prayers. Please accept my sincere and heartfelt condolences to each one of you as Bill enters the new horizon of his eternal journey. I know he was greeted joyfully by all who love him beyond the veil. I spoke to you a couple times at morale events and in the company office, but I didn’t know you that well. However, I saw a guy trying his best to overcome the turmoil of life. Sorry you weren’t around long enough to appreciate your freedom from the Corps, but I’m also grateful that you answered the call to service and hope that you considered your time well spent. RIP, Bahr.